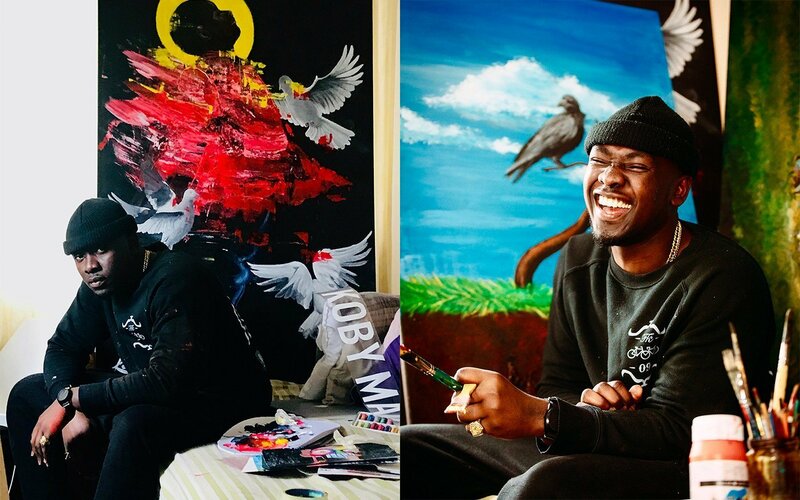 British based artist Koby Martin is a proud export of Ghana. His talent and God-given gift was nurtured in his motherland and polished in the United Kingdom. These worlds merge together in Koby’s art where his African descent and background can be seen as a consistent influence. 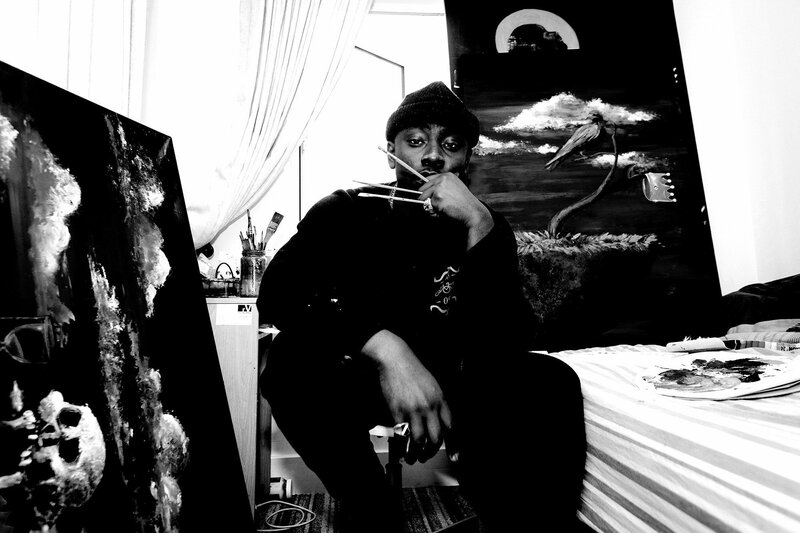 Throughout his career, Koby has been responsible for various creative content for global artists, including the debut album cover for Krept & Konan, Nico & Vinz and Jessie J.
Koby has also worked with multiple brands on various projects including Google, Motorola Bacardi, Adidas, Universal Music, Virgin Records, Marley, Def Jam, Vype Pebble, AFIE (African Footballers In Europe), and Mercedes Benz. The latter of which featured Koby’s artwork painted on a limited edition fleet of Mercedes Smart Cars. As the in-house designer for Disturbing London, he has worked on projects for the likes of Wizkid, Tinie Tempah, G-Frsh, Yungen, A2 and more. His artwork and various commissions can be purchased and viewed at Kobmart.co.uk. Lytt Labs caught up with Koby Martin to find out what makes him tick. My name is Koby Martin. I’m an illustrator, animator & painter. Take us through a typical day in your life. I’m a very spontaneous individual so…I sort of go according to how I feel. On a regular day, I wake up, brush my teeth, take a shower, check my emails; all the normal stuff. Then go through my mood boards and straight to the canvas, picking up where I left off from the previous days/nights. If I’ve got meetings then I’ll go but I’m mostly indoors working on pieces and paintings that I have to complete. What’s your time management style like? My time management style is very disciplined. I don’t usually go out unless necessary. Obviously, every now and then I take breaks init, like meet friends, socialise and what not, but it’s rare because as an artist you’ve got to be disciplined. You set a goal for yourself in the year and there are so many things you want to tick off. There’s a number of bodies of work that you have to accomplish or have to create for a show/a gallery. It’s just discipline you know, when you’re disciplined you manage your time properly, so it’s just something that comes with it. Apart from work and creating, what other pursuits do you enjoy? Sometimes hang with my friends as I said. If I’m by myself and taking a break I’m simple… (laughs) I’ve got my PlayStation 4 console, I play Fifa. It actually helps me strategise and think – it’s funny! It’s not like just a game, I don’t just see it as a game anyway. The break gives you clarity on the things you need to do. I quite like adventure games as well, I got a few series of them. I don’t think I decided to become an artist.… it chose me. You know I realised it was something I couldn’t stop doing or something I was always itching to do. It’s like an itch you can’t scratch, like an itch on your back. You’re trying to reach for it but you can’t scratch it. You’re gonna keep trying to scratch it. I just want to work and create because I have so much in me. It’s not like one moment I decided oh I’m going to become an artist. It just happened. I wouldn’t… OK! I wouldn’t say it just happened but it’s something that’s always been within you know. I realised I wanted to become an artist at the age of 12 and from that point on. I realised it had always been something that’s within me and it started to come out at that age. That I realised OK, this is what I want to do. So you know what I mean? It was more a realisation than a decision. Does that make sense? How would you describe your art style and how it has evolved? There’s no description or way I describe the work bro. Maybe I can say it’s spontaneous but, I wouldn’t like to box it or give it a word or a title… you know what I mean? Most of the things I create come from… emotions. Emotions are spontaneous you know, one minute you’re on the high one minute you’re on the low and the next minute you’re in between so, you can’t really control that. It just happens bro. Do you have a favourite art piece? It’s hard to choose man, it’s hard to choose because… like I said they come from emotions. I don’t think I can choose what art piece I like or love, it’s just every body of work has a significance and you know it would be really hard to choose (exhales). My thing as an artist is to tell the story and express what I’m trying to say through the gift I’ve been blessed with. I don’t think ‘it’s up to him’ or up to the artist to choose what his favourite is. It’s not up to us, it’s really up to the audience. How did the Lytt Labs collaboration come about? I think we both have something significant about what we do. Myself as an artist and Lytt Labs being contemporary and forward thinking. With Lytt I felt like my work would be a good addition to the watch. You know the watch is an outstanding piece in itself and my work you know… being pretty striking itself. Both of them coming together, for us to make this collection is amazing. Yeah man, I’m excited. I’m currently working on (apart from the upcoming project with Lytt Labs), my solo exhibition. To be honest that’s all I can say for now. The solo exhibition that I’m looking to launch in September… it’s like my seventh I think. So yeah that’s coming up later in the year. (Laughs) I haven’t really picked up a book properly in a long time, I have a quite short attention span naturally – hate to believe that but it seems that way. I can’t just… I’m a very hands-on person. I can’t just sit still for long. I mean I know picking up a book is good, I’d like to advise everyone to do that, but for me, I can’t sit still for long. Man you know I find it hard. I have to be active and doing something. Even watching a movie I get distracted… it’s a bad habit. I did start reading The 50th Law, written by 50 cent and a famous author I’ve forgotten his name. It’s a book about being fearless in ambitions and chasing your goals. Ah man! A lot of Travis Scott. Right now I’m listening to a lot of old school Kano, Giggs, Skepta – Old school Skepta, you know some new Skepta too. Kanye, Krept & Konan. Yeah, we mix it up with just… a whole load of stuff (laughs) just mix it up. How do you find creative inspiration? Life! That’s the best way I can put it you know. There’s always something to, to write about. There’s always something to, to draw inspiration from. You know nature, architecture, music… life man you know! That’s where; that’s how people get inspired to make movies and… that’s where all these ideas come from. True life. Movies based on true stories. So for me being an artist and having the ability to paint, it comes from my life you know. I’ve been through a lot and yeah that’s where the inspiration comes from, going through the motions and… (laughs) the punches life throws at you. I’ve been able to deal with and I always bounce back and created something out of it so. Yeah, life is inspiration. What does the future hold for Koby Martin? In the next 5-10 years, I see myself all around the world. I see my work being shown all over the world, and I see myself having a gallery of my own; exhibiting my work and you know, up and coming young artists as well. I see myself collaborating with more top brands. I’d like to have exhibitions from Dubai to Japan to Korea to America, everywhere in the world bro! That’s the dream… that’s what life looks like man. What does the concept of time mean to you? I think everybody is a total sum of how they use their time. So you know time is the most expensive currency. You can never get it back and your life, time is a measure of your life, so to spend time doing something or creating something, that’s a part of your life you’re spending. Yeah, time is valuable as much as we say it, but time is expensive too… it’s not refundable (laughs). It’s expensive but it’s not refundable, you can spend it but it’s not refundable. CREATE! Take time to create whatever it is that you want, whatever you set your heart out to do/to accomplish. Take time to… don’t rush the process but trust the process, believe in what you’re doing even though it may not look like it’s going your way. A lot of people will give up on you, a lot will question you, a lot will see the vision… but you can’t force vision on the blind. Take time to create man, take time to create whatever dream, ambition whatever goals you set for yourself… and work on it, man!